"His Nobility holds True to his Stallion Heart"
Throughout his life’s span Genius' Boy Pride has displayed and promoted the highest nobility that endears the Tennessee Walking Horse to us all. His first tests of athletic strength began in a pasture with other hopeful young colts to culminate in a show career achievement of three consecutive World Championships-1988, 1989, 1990. In 1993 Maple Crest Farms had the distinctive honor and privilege to become Genius' Boy Pride’s new and forever home. As Genius ruled in the show ring, he soon asserted his noble presence on this farm and its resident family. This magnificent stallion took Maple Crest Farms as his domain and those within it as his herd-to love, protect, and guide. His presence became the heart and soul of this farm! As the Stallions of Yesteryear, he became our one and only breeding stallion. Within his second life’s career Genius' Boy Pride stood at stud from 1993 through the spring of 2000 and sired over one hundred off-spring. At shows across the United States as wins are called, the name of Genius' Boy Pride's off-spring is a commonly expected occurrence. Genius' Boy Pride earned and will always be remembered as a father of champions. National Futurity Champion for 1998, he was also the Futurity Sire of the year in Michigan for 2000, 2001 and 2003. A Special Award: On January 28, 2006 Genius' Boy Pride received the Mid Ohio Walking Horse Association 2005 Lifetime Promotion Award. This was given to Genius' Boy Pride for his years of serving as an exemplary example of the Tennessee Walking Horse. Maple Crest Farms garnered the Championship and Reserve Championship promotional awards as well as many others. In the spring of 2000, Genius was stricken by strangles which nearly ended his life. The bacteria traveled throughout his body ending his breeding capabilities. There was sorrow over the loss of breeding but celebration that this magnificent stallion defeated the Grim Reaper. 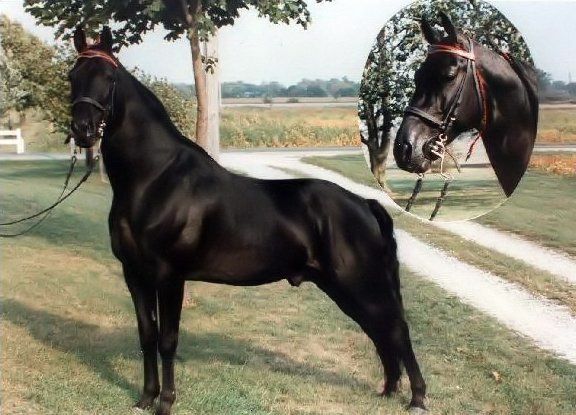 Genius continued his career in promotion of our superb Tennessee Walking Horse. He and his owner Joyce Marie Moyer are well known for their unceasing efforts to promote the TWH above all breeds. Their promotional activities are legendary as ambassadors to the Ohio Equine Affaire (eleven consecutive years), Massachusetts Equine Affaire (by specific request), Fantasia performances, Breed demonstrations, seminars with clinicians for Synergist saddles, T-Touch Linda Tellington Jones, Deborah Bennett-Conformation Specialist, featured equine on television promotions, trail riding recognition from those of other breeds, the list goes on. This pair-Genius and Joyce, stallion and owner, friends for life are an exemplary example of the TWH lifestyle and true promotion of our breed. Genius’ strength, intelligence, and grace are what attract each of us to him. The confident, serene feeling that settles over us as we gaze into his eyes is what steals our breath away as we stand in his presence. As our heart, matches beat with his, you know, without doubt, nothing can defeat us, anything can be accomplished if we just don’t stop-the heart beats out power, champion, and unending desire to achieve. Genius' Boy Pride will be remembered for his incredible disposition, his gentleness to all, his “look at me” presence in life, and his powerful, natural, ground-covering gait. · Doris Squire- Sagittarius Farms, Middle Mi. who owned the Dam, Independent Delight. · Joyce Marie Moyer- owner and friend. English is her first language, Genius(') her second. Genius has left a legacy and a presence at Maple Crest Farms that can never be replaced. His nobleness will continue to live in our hearts and course through our veins. He will be remembered forever by those whose hearts and souls his spirit has touched. Genius has left our physical world, surrounded by his herd, supported on either side by his favorite mares, held by his best friend-Joyce Marie, still ruler of his personal domain. Couldn’t we all wish to leave this world in such a positive heart-strong moment? Thanks to all for your personal condolences. Let us remember: The sounds of his hoof beats will ever echo in our hearts.